Vintage From Paul is delighted to offer these classic Bailey Walker Vitrified White Restaurant Ware Grille Plates.These plates are dated to 1937. The Bailey Walker Vitrified White Restaurant Ware Grille Plates have a solid white vitrified china body. The plates are divided into three distinct sections of a "grille" plate. Each of the available Bailey Walker Vitrified White Restaurant Ware Grille Plates is in superb condition with no chips, cracks, and few, if any utensil marks. 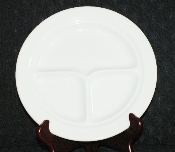 The Bailey Walker Vitrified White Restaurant Ware Grille Plates measure 9-1/8 inches in diameter. The back of the white grille plates is marked in blue with a book and "The Bailey Walker Vitrified China, Bedford Ohio, 1937".